So far I have been using DVD-R media. For the first time I have used DVD+R to burn some data using Nero Burning ROM software on Windows 7. When Nero was just about to start the burn process it gave a notification. 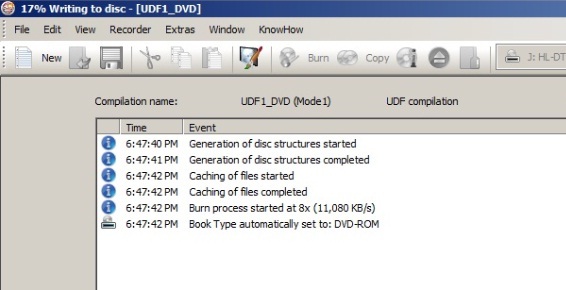 Book Type automatically set to DVD-ROM. I wonder what this notification is about. There’s very little info available on the Internet. I though it is to make DVD player believe that the inserted disk is a DVD-ROM so that DVD+R can seamlessly be played or supported, but I am not sure. When I insert the burnt disk into the DVD Writer and run Burn Aware Free app, it clearly identifies the inserted disk as DVD+R. Would be great to know the exact meaning of this notification. This is a remnant from the CD times. The standards for writing various types of content were defined in a set of books differentiated by the color of the binding (often called "rainbow books"). Red book was for Audio CDs, white book for Video CDs etc. Later when the DVD standards were defined they did not use that color coding, but recording applications still use the term "book type" when referring to the writing standard they use. How to Make an Autorun CD /DVD with multiple .exe files?